Did you know the average difference between a typical lender credit tier is less than 30 points? More importantly there is only a 96-point spread between a top credit tier (excellent credit) to a lower tier (credit challenged). This narrow spread demonstrates an opportunity for dealers to put their customer in a higher credit tier by pulling a second (or third) bureau, possibly qualifying them for a much better interest rate and creating a great customer experience! Not to mention providing the opportunity for dealers to make more reserve income on the loan. Since the FICO scores depend on the data contained in your credit file, you will not see the exact same score from every bureau due to the differences on what they report and how they maintain the data. Many lenders report their data to the credit reporting agencies on different dates. Scores are calculated real time, so they could reflect fresh data from one lender at one bureau and 10-day old data at another credit reporting agency. Some lenders report to all three major credit agencies, but others report to only one or two. This means a credit agency may be missing information that helps or hurts your score. There may be reporting errors on one bureau that do not show up on the other two. Some information could be considered old and closed at one agency and not retained and still exist at another. Here is an example of a typical lending table showing the score range and associated credit tier. We can use this as a reference for some real-life examples of the credit spreads that can exist between credit bureaus. Each example below includes actual credit scores pulled for one individual, reflecting the variance among the bureaus. Example One: 108 Point Spread – Tier 3 to Tier 1! The first example demonstrates a large 108-point spread between bureaus, with one bureau showing the lowest score which puts the consumer into Tier 3 and another has the highest which puts the consumer into the most favorable lending tier. In this example there is only a 1-point difference between 2 of the bureaus. If the dealer only pulls the first bureau, they might lose the deal due to the higher interest rate offered because of the lending tier the consumer falls in to. But since they pull all three and have associations with lenders that accept all three – they have the opportunity to get the best rate possible for a Tier 1 customer. This second example is a more modest point spread of 51 points between the highest score (734) and (683) with the third falling right in the middle (707). Even a more modest 51-point spread will move the consumer from a Tier 3 to a Tier 1, getting the best interest rate available from the lender. 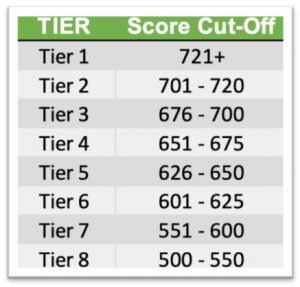 Example Three: 12-point Spread – First Score (710) is Tier 2, but the third score (722) is a Tier 1! Not all spreads are large; this example shows a very tight range of 12 points, but what is important is that if the dealer stopped at the first score of 710, the customer would have been put in Tier 2. But the dealer in this example pulls all three bureaus and the third score is 722 which bumps them up to Tier 1! It is important to know which of your current lenders will look at more than their primary bureau and accept scores from alternative bureaus – especially if your client falls a few points short of the next best tier. Most will look at a secondary score and some will look at all three, but only if asked by the dealer. If dealers are having trouble getting their current lenders to look beyond their primary bureau score(s), you could potentially seek out relationships with other lenders willing to take a more aggressive approach to fund your deals. Especially in the middle tiers, the number of lenders with programs for mid-tier credit is growing rapidly. Ensure you have lender relationships that cover all three credit bureaus. Lack of formal training can have an impact on which reports F&I managers use. Typically, F&I managers are trained on which bureaus to pull by their predecessors, who were trained by their predecessors, so they may be using the same bureau(s) for no particular reason other than history. The advantages of pulling multiple bureaus – not to mention when and why – needs to be part of new F&I managers training so appropriate knowledge is transferred when there is turnover. Most F&I managers still use the credit reporting agencies report formats. These are unique to each bureau and very difficult to read. Each has their own proprietary codes which are embedded in a mass of information – found in different locations across reports. Make your life easier. Ask your credit report provider if they have a standard report view that takes each bureau’s information and puts it in a common, readable format so that all information can be found in the same location no matter which bureau is utilized. Codes are typically translated to verbal messages that are much easier to ready. This makes interpreting credit scores across bureaus much easier. Increased customer appreciation and satisfaction: your customers will appreciate you working harder with lenders to get them the best interest rate possible. How many bureaus do dealers pull on average? Roughly 25% pull all three nearly every time they search for funding for their customers. Another 35% pull at least 2 bureaus. Are you one of the 40% that only pulls one bureau? Technology. Have the right technology to provide your managers the ability to quickly and easily select the right bureau and tier based on the highest score that lender will use, in addition to other information that may differ from bureau to bureau is critical for success. Process. Ensure you have a consistent procedure to pull all 3 bureaus at the right time in the sales process BEFORE desking the deal is critical to maximizing the benefits of the multi-bureau strategy. Training. Thorough and on-going training is key especially if turnover is an issue at your store. Ensure there is a process for knowledge transfer of key lending practices including strategies for multi-bureau pulls to fund the best deal for your customers. Senior Management Review. Senior management must continually show their commitment to the process agreed upon by meeting with managers on a weekly and monthly basis going over key reports that show both the commitment to and success of the multi-bureau strategy. For more information on how you can take advantage of a multi-bureau strategy at your store, please contact 700Credit at: 866-273-3848 or email at: sales@700credit.com.